I spoke to economist and "The Great Depression Ahead" author Harry S. Dent Jr. in early 2009 on his think tank's predictions. How right was (and is) he? You decide. HARRY DENT JR.: The biggest surprise was how fast the oil and commodities markets melted down in the second half of 2008. Our 29 to 30-year commodity cycle still points into around late 2009 or early 2010. We would have expected oil prices to fall $50 to $80 and then retest the highs or make new highs with the stimulus program, and likely rebound into late 2009/early 2010. Now it clearly appears that the commodities and oil bubbles have already peaked and that we will merely get a strong bounce towards $80 plus with the anticipation of a rebound from the massive stimulus program. The reactions to the book thus far are good given that the economy and stock markets are so weak. Normally our books come out ahead of such changes in trends and people are skeptical of our contrarian predictions. This time we are warning that the worst is still to come and that we will see another major stock crash between mid to late 2009 and late 2010, and that we will not likely come out of this major downturn until around late 2012 or so. DENT: The hardest thing to convince people of in the last several years was that house prices could go down a lot! We would show the example from 1925 to 1933 and 1991 to 2005 in Japan. People have seen real estate go up their entire life and with only minor corrections. People can believe our predictions for another major stock or oil crash, but not real estate. Well, obviously, now they do believe it. We are saying that house prices nationally have to go down 50% to 55%, or back to at least the levels in 2000. Hence, there is another major crash in housing prices ahead as well with the worst slide likely from early 2010 into mid 2011. We don’t recommend buying real estate again until around late 2012 or early 2013. The bubble in real estate is the greatest in U.S. history. We wouldn’t see as large a decline if the bubble had not been so extreme. Housing prices only went down around 30% in the Great Depression as there wasn’t a major bubble before the deflation process set in. DENT: First of all, the government cannot save us. They did not create this boom, the baby boom generation did – and they can’t stop the steep slide in spending ahead as that generation slows in their spending and accelerates in their retirement. At best we will get a strong temporary rebound, but that will be met with inflation pressures and accelerating oil and commodity prices again. At worst, and more likely, all of this stimulus will only create a modest rebound and that will be seen as a sign of serious weakness with the stock markets and US dollar crashing again. The best thing people can do is to save and to convert their stocks and excess real estate into cash during the temporary rebound in 2009. Our target for the Dow is just below 11,000 between April and July. Sell your investments and wait for all assets to deflate into late 2010 to late 2012. Then buy at the greatest bargains of your lifetime. Can Obama divest people or their delusions? DENT: It is natural that we move more from manufactured goods to higher value added services as we grow more prosperous over time. However, a lot of the growth in areas like financial services has been “fluff”. The economy will quickly straighten this out by killing companies that weren’t real. Obama’s challenge is not to create too great an expectation that the government stimulus will lead to a sustainable rebound by 2010. It won’t. By early to mid 2010 we expect to fall into a deeper downturn or depression, despite the massive stimulus plans which will likely only have a temporary impact for about one year. 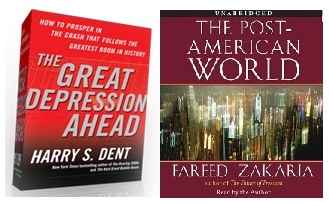 On the book "The Post American World:"
DENT: Most western nations are aging and will never see booms like we just had again as future generations will be smaller, not larger. The growth will inevitably shift even more towards emerging countries, especially in Asia after this crash. The U.S. will still be a major power, but not the only power. Europe and Russia will fade due to actual declines in population in the coming decades, and China will follow after 2020. DENT: Unfortunately in these longer term cycles that we track and forecast, human nature is such that we do forget what happened in the past, and we aren’t that aware of these cycles--and neither are most economists! We always think it will be different this time, and there are always differences and advances in technology and etc. However, cycles do repeat themselves throughout history. The stock market has peaked long term on major generation cycles every 39 or 40 years: 1929, 1968 and now 2007. Commodity cycles have peaked about every 29 to 30 years: 1020, 1949 – 1951, 1980 and now 2008. 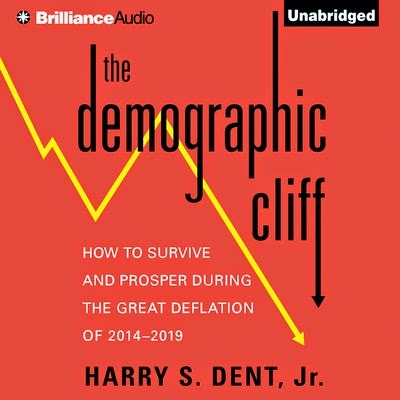 His new book is THE DEMOGRAPHIC CLIFF: How to Survive and Prosper During the Great Deflation of 2014-2019. I recently posed this question: Can America sustain a $100 Trillion debt without collapsing due to Fed IOU policy?